Now that the weather is starting to get a bit cooler my family and I want warm soup or other comfort foods for dinner. I am always game to try something new so we don’t get stuck in that dinner rut. So when I saw this recipe over at Skinny Taste I knew we would have to give it a try. The family loved it and my husband ate on it for a few days since he was carbo loading before his marathon. 1. In a deep pot, saute onion and garlic in olive oil over medium heat. 2. Add chicken broth, water, tomato sauce, celery, carrots, basil, bay leaf, parsley, oregano, salt and pepper. Bring to a slow boil. Let simmer for 20 minutes stirring occasionally. 3. Add pasta and cook uncovered until pasta is al dente, according to pasta directions. 4. 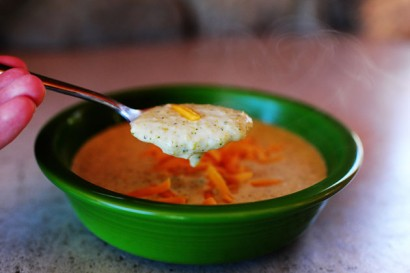 Ladle soup into bowls and top with grated cheese. I am defiantly in a soup kind of mood these days. 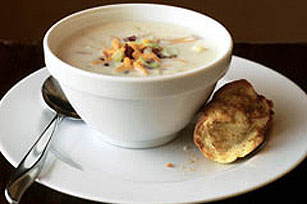 Warm creamy soup on a cold day just makes your day. Paired with a great slice of bread and I am in heaven. Not to mention that my kids will eat almost anything if it is in soup form so I can sneak in some veggies that they wouldn’t normally eat. Last night it was Corn & Cheese Chowder from The Pioneer Woman. I used the 2 ears of corn from this weeks basket and then I had cooked, cut off the kernels, and froze corn from 3 ears of corn a few months ago. I also used up some of the bell peppers from a few weeks ago. This was a great clean out the fridge and freezer recipe for us. I was able to use up quite a few of our wonderful bountiful basket produce in one pot. We enjoyed ours with the wonderful Italian Olive Oil bread that we had gotten a few weeks a go and froze as well. A great meal that really hit the spot on a cold night. Enjoy! 1. In a large pot over medium-high heat cook bacon. Once bacon is cooked through add in onions and butter and cook for a few minutes. Then add diced bell peppers and cook for a couple minutes. Finally, add corn and cook for a few minutes. 2. Sprinkle flour evenly over the top and stir to combine. Pour in broth and stir well. Allow this to thicken for 3 to 4 minutes, then reduce heat to low. Stir in half-and-half, then cover and allow to simmer/thicken for 15 minutes or so. 3. Stir in cheeses and green onions. When cheese is melted and the soup is hot, check seasonings. Add salt and pepper as needed then serve immediately. I love to get creamy soups for lunch, especially from little sandwich shops. I have tried to master them at home but haven’t been super successful. The first Broccoli Cheese recipe I made called for Velveeta. Now keep in mind I have never cooked with Velveeta and I soon found out why. It gave the soup a very weird consistency and taste. Defiantly never going to use it again. This last weekend I was watching The Pioneer Women’s Cooking show on The Food Network and she made a Broccoli Cheese Soup that had ham in it. My husband caught a little bit of the show and started drooling over the recipe so I new we had to make it. That and the fact that we got 2 bundles or 4 heads of broccoli in our bountiful basket that we needed a new recipe for and the rest is history. This was a super easy Broccoli Cheese Recipe that satisfied the whole family. A keeper for our family! 1. Melt butter in a pot over medium heat, then add the onions. Cook the onions for 3 to 4 minutes, then sprinkle the flour over the top. Stir to combine and cook for 1 minute or so, then pour in milk and half and half. Add nutmeg, then add broccoli, a small dash of salt, and plenty of black pepper. 2. Cover and reduce heat to low. Simmer for 20 to 30 minutes, or until the broccoli is tender. Stir in cheese and allow to melt. 3. Taste seasonings and adjust if needed. Then either serve as is, or mash it with a potato masher to break up the broccoli a bit, or transfer to a blender in two batches and puree completely. I am a big fan of soup. A good bowl of soup can make my day so warm and especially during these colder winter months. I have a few favorite soup recipes but this one is one of the easier recipes. To save your self time you can use frozen southern-style hash browns. But we had several bags of potatoes at our house so I opted to use fresh ones. If you like your soup thinner just add a bit more milk to thin it out. Mix milk and soup in large saucepan. Stir in shredded potatoes. Bring to a boil on high heat, stirring occasionally. Stir in cheese and bacon. Reduce heat to medium-low and simmer 10 minutes, stirring frequently. 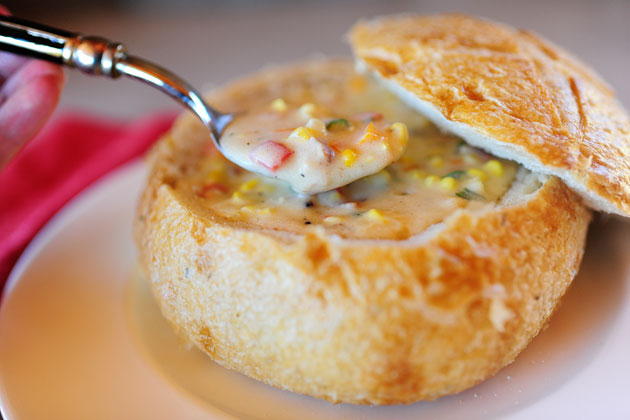 Ladle into soup bowls and garnish with green onions, bacon, cheese, or sour cream. Could winter really be this close? Not where I am at! I can’t believe it is the middle of October and we are still seeing days in the 90’s. While I know that colder weather is just around the corner I am still happy with these warmer days! 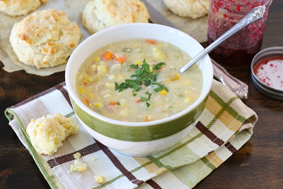 I do miss soup weather and so I decided we were going to have a Corn Chowder recipe from two peas & their pod not matter how warm it was outside. This recipe was super simple and I loved that it used so many different veggies. Most of which my refrigerator has been accumulating over the last few weeks from bountiful baskets. This was a hit with the family even though my husband said it would be even better with bacon. Well of course it would, everything is better with bacon! I hope your family enjoys it as much as mine did. 1. In a large soup pot, heat the butter over medium heat. Add the onion and garlic, cook for 2-3 minutes. Add the carrot, red pepper, poblano pepper, and potatoes. Add the chicken broth and empty ears of corn, if using, and cook until vegetables are tender. This will take about 10 minutes. 2. In a medium bowl, whisk together the flour and milk. Pour mixture into the soup pot. Stir. Add in the corn kernels, thyme, salt, and pepper. Let the soup simmer for 20-30 minutes. 3. Remove empty ears of corn, if using, and ladle into bowls. Garnish with cheddar cheese, if desired. Now I know it isn’t exactly soup weather however the temperatures where I live have dropped from the 100’s into the mid 90’s so I can justify making soup. 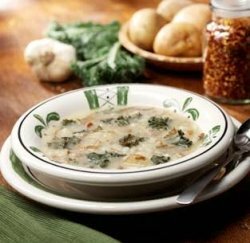 This is my all time favorite soup and I was so happy that I found a copycat recipe that tastes as good as getting it at the Olive Garden. So when I got some Kale in my bountiful basket this weekend I knew exactly what I would be making with it! 1. Cook sausage in skillet until brown. Drain on paper towels and then crumble. 2. Place onions, potatoes, chicken broth, water, and garlic in a pot. Cook on medium heat until potatoes are done. Once potatoes are done mash them up a bit with the back of a spoon to thicken the soup. 3. Add sausage and bacon. 4. Salt and pepper to taste and the simmer for another 10 minutes. 5. Turn to low heat and add kale and cream. Heat through and then serve. With a house full of sick children and a sick husband I thought it would be a great time to give homemade chicken noodle soup a try. I had tried a recipe a few years back and wasn’t to thrilled with it. This recipe however is amazing. I especially like how you puree the onion and add that to the soup. It gave it a great flavor without the bits of onion in the soup. 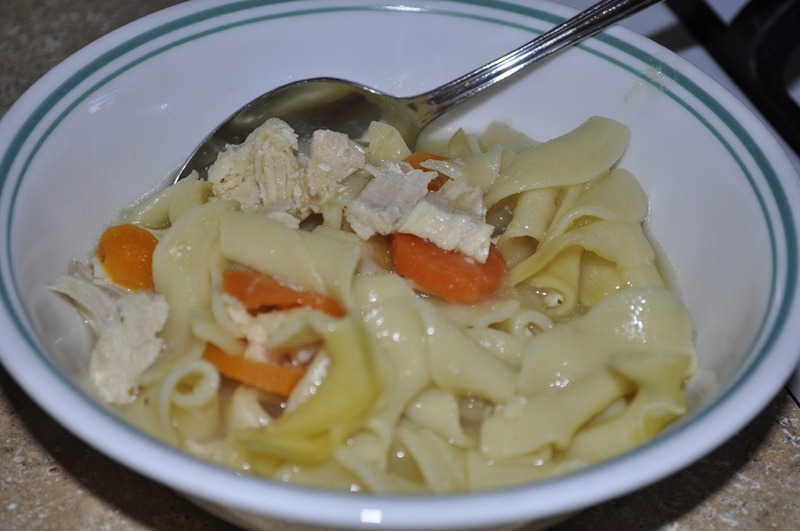 A great recipe for the sick or just to keep warm on a cold day. Hope you enjoy! 1. In a large stock pot combine water, chicken and salt. Cover and bring to a boil then reduce and simmer for 20-25 minutes or until chicken is done. Remove chicken and cut into bite sized pieces. Strain the reaming chicken broth and put back into the stock pot. 2. Peel onion and chop into chunks. Combine 1/2 cup of water and onion in a food processor or blender and puree. Add to the chicken broth. 3. Add carrots, chicken granules and celery. Bring to a boil, then add egg noodles. Cook the noodles until done about 15-20 minutes. Once the noodles are done add the chicken and heat until warm. If you need more liquid add either chicken broth or water and season with more chicken bouillon granules, salt and pepper to taste.